Niki Alling's Blog: 4th of July, Dating and Sparks! In honor of the Fourth of July, I think this is a fitting time to talk about that exciting, fun, wonderful, thrilling, crazy making, awe inspiring.... spark! Ok, I love fire works just like anyone else...but when it comes to dating, what and where and how does that elusive spark come into play, and better yet, how do you keep it lit? Is it a fantasy, is it real and how can I find it? These are the questions that women and men have been asking since the first lightning strike started the first forest fire. I used to believe in the "spark", I did. And part of me still does. But as time goes on and I've met more and more people, I'm beginning to believe that, yes you can feel a spark for someone when you first meet, but to have a real spark, a real passionate fire burning love for someone, now that takes time. Just like smoldering coals in a fire pit, it's a long slow process. Not one that just explodes in the air with frenzy and excitement. If you want sparks that will last, the real ones, the ever lit torch of the Olympics, you actually have to make it happen. You have to get right down on the ground and hit the flints together and blow the smoke, and keep watch all night long to make sure it stays lit. And then one day, you will look at each other and realize there was a fire burning all along. If you're dating, and you've found someone who fits your personality, and gets your jokes, and is fun to be around....don't give up if the initial spark isn't there. Don't throw in the towel just because the sky didn't light up when they walk into a room. People say they want long term relationships, but are off and running as soon as the first spark doesn't catch fire. I ask those people...are you looking for the flame of a candle or a bomb-fire? Because a candle flickers fast and blows out, but a bomb-fire takes much longer to build and can last a very long time. I for one, am building coals in my fire pit that will last a very long time. I see now how the sparks are fun, but they are not long lasting. When you're out watching fireworks this July 4th, count how many seconds they last in the air. Then go to a bomb-fire and watch how many logs people throw on to maintain it and how many hours it will last. My Grandparents were married for over fifty years. When I had my first divorce, my Grandfather said to me..."You kids don't know anything about commitment." He was right. We were in it for the sparks and fireworks, not the bomb-fire. And now my dear 95 year old Grandmother said to me just the other day..."If a man is looking for sparks, light a firecracker under his a##!" God love her! But she is right too. She knows that the sparks are fleeting, and true love is built on friendship, laughs and hard work. The things that keep the fire burning for years! 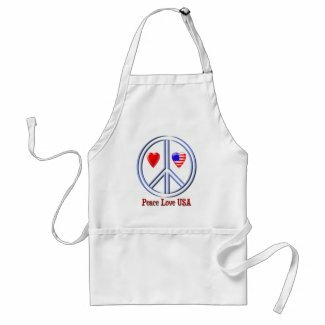 Here is a fun apron to wear at the grill this 4th of July!